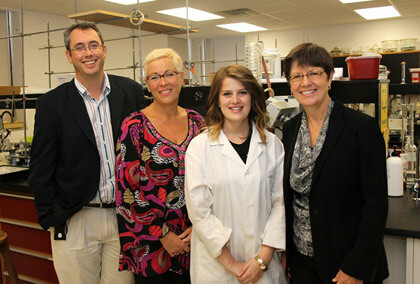 Taryn O'Neill is the 2013 recipient of the Carol Ann Cole Comfort Heart Studentship Award presented by The Canadian Breast Cancer Foundation - Atlantic Region (CBCF - Atlantic Region). Taryn O'Neill, a UNBSJ alumna, spent this summer working at Dalhousie Medicine New Brunswick in Saint John, under the supervision of Dr. Christopher Gray and Dr. Duncan Webster. Taryn's research focused on identifying the compounds in a plan that has been used medicinally by local aboriginal people and has shown promise for anti-cancer activity. Ultimately, her work could contribute to the discovery of new treatments for breast cancer. Each year, the CBCF - Atlantic Region Studentship Awards program gives young researchers the chance to take their learning from the lecture hall to the laboratory while fostering an interest in breast cancer research. These awards ensure that a young researcher studying in Atlantic Canada will receive funding for their work on a 14-week breast cancer research project. The Carol Ann Cole Comfort Heart Studentship Award will be presented in perpetuity to the top ranked applicant of the annual CBCF - Atlantic Region Studentship Awards Program. Carol Ann is founder of the Comfort Heart Initiative, which has raised well over a quarter of a million dollars for CBCF - Atlantic Region and over one million dollars for cancer research overall. Since 2006, more than 45 students have received CBCF - Atlantic Region Studentship Awards for their work in the breast cancer field.